The importance of mentoring is central to Anthony Wutoh, PhD, RPh. As Co-Director of the Developmental Core of the DC D-CFAR and Associate Dean of the Howard University School of Pharmacy, Dr. Wutoh emphasizes the importance of the D-CFAR in providing mentoring as a service to early stage and new investigators. "Many of us have learned the hard way, but it makes the process a lot easier if there's a mentor who is willing to share with you their knowledge and expertise." Dr. Wutoh recalls one mentor in particular who made an impact on him as a junior faculty member. "He shared with me a number of things, invited me to participate in his research group [and] was willing to work with me in terms of development of grant applications." Born in Ghana, Wutoh's family moved to Maryland's eastern shore when he was still young. He cites family influences as a reason for his pursuit of pharmacy and for his subsequent academic career. His father, a professor at the University of Maryland Eastern Shore, was involved in both plant genetic research and marine biology. "I remember him taking us to his labs and seeing his experiments and reading a lot of his different books." His interest in epidemiology and HIV research was sparked when he attended a seminar in graduate school given by a visiting lecturer. "She was talking about the impact of HIV on a particular population in terms of survival and in terms ofâ€¦ essentially wiping out a generation." Dr. Wutoh went on to do his dissertation on the differences in treatment time between black and white patients with CMV retinitis, an infection that afflicts immunocompromised patients, specifically those with HIV. Today Dr. Wutoh's work concentrates on health disparities and his recent research interest has been in HIV prevention and treatment in older African Americans. "We've done a number of projects recently in terms of identifying risk behaviors among older African Americans and looking to see if there's an association between spirituality, risk behaviors with HIV and knowledge." Other areas of interest include exploring alternative therapies in HIV treatment and training and education of pharmacists to serve as primary health care resources in countries that lack the same health capacity as western countries. 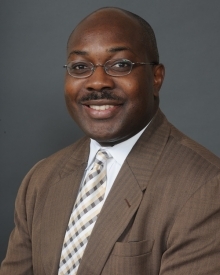 Dr. Wutoh currently serves as the Principal Investigator for the Howard University Center for Minority Health Services Research, funded by the Agency for Healthcare Research and Quality. When asked about the importance of the inclusion of minorities in health research, both as participants and as investigators, Wutoh says "I think their inclusion will go a long way in producing more nuanced research and better care and treatment options, helping us to address the epidemic in a more effective and comprehensive way." In terms of his scientific vision for the DC D-CFAR, Wutoh puts emphasis on the necessity of developing a solid research network and developing "more basic scientists who are positioned to do translational research, so to not just look at the mechanisms of the disease but also to develop new drug candidates". Regarding the Developmental Core, Wutoh says he eventually wants to be able to provide a mentor for any investigator that requests one. In sum, Dr. Wutoh says "I hope that because of research we are conducting through the DC D-CFAR we will have a measurable impact on the epidemic in D.C., through better prevention, care and treatment and new scientific discoveries."